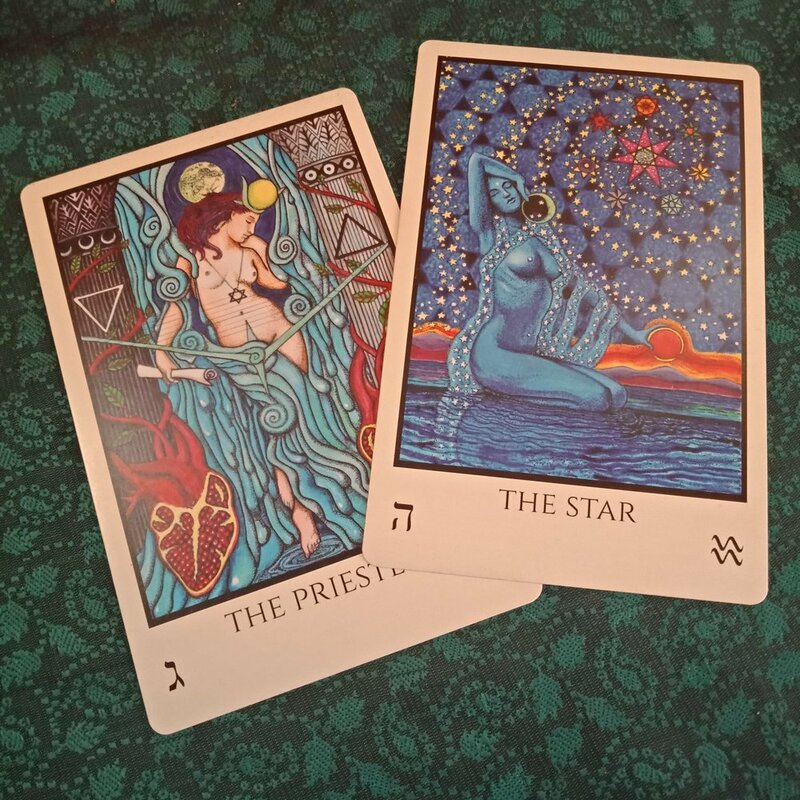 Here are some insights and exercises to help you connect more deeply with the astrological Moon within yourself - using your tarot deck. The associated tarot card for the astrological Moon is the High Priestess. The High Priestess emphasises the feminine qualities of the Moon. The are straightforward connotations here, like the menstrual cycle, but more broadly it also speaks of the receptive, intuitive and mysterious qualities of the emotional dimension. No matter where you sit on the gender spectrum, or how spiritual you tend to think you are, know that we all have an inner High Priestess. We all have a lunar quality. What we’re talking about are universal aspects of human nature. We're just talking about them metaphorically. Try to see your Moon sign and the cards associated with it as metaphors for the emotional, intuitive and receptive dimension of yourself. The Priestess from the Tabula Mundi Colores Arcus Tarot. Note the symbol at the right hand corner. OK, let’s take half a step backwards. What do we even mean by having ‘a planet’ in ‘a sign’? I described the astrological Moon above as a "dimension", but planets can also be conceived of as archetypal forces or aspects of the Self. The zodiac signs are styles of experience. So when a planet is in a sign, a force is being expressed in a certain style. Here's how to play around with this idea with tarot. Feel free to use any tarot deck that tickles your fancy. The core card is the card that represents whatever planet/force we're focusing on. So in this case the core card is the High Priestess representing the astrological Moon. The style card acts to modify the core card. It's kind of like the High Priestess has 12 different masks, or outfits, that she could be wearing. Below I've provided a brief interpretation of each moon sign placement, just for reference. You'll also find which tarot card relates to that particular sign. Pull your style card out of your tarot deck along with the High Priestess and consider what these two cards have to tell you about your own habits, security needs and instincts. What extra dimension does the style card add to the High Priestess. What extra needs does she (you) have based on its meaning? This might not be a super easy exercise, but just let yourself play around with it. Try it with different tarot decks. See what you might uncover about your own inner High Priestess/lunar aspect. Habits. Security needs. Instincts. Intuition. Subconscious. Self-care requirements. Nourishment. Receptivity. Heritage. Bonding. Sensitivities. Projections. Safety. Coping mechanisms. What makes us happy/prevents depressive tendencies. What’s comfortable. Emotions. The ebb and flow of mood as well as cycles of growth and development. Nature and nurture. For the Moon in Aries emotions are expressed through assertive action. Emotions are verbs. And this Moon needs the freedom to act on its feelings. Safe spaces to express frustration and positive aggression are strongly advised. As is remembering that anger is a sign that they care. Having no outlet for emotion is a fast track to depression for all signs, and the fire signs also need to keep note that fire finds its way out one way or another! Patience is its virtue and this is a Moon sign with strong, often sentimental, value systems . This Moon sign is also the most likely to express affection in the form of baking or something else handmade. This Moon is at home with tradition. It also needs to move at its own pace and take the time to nourish itself through the senses. The better the relationship with the body, and the more stable the physical environment, then the happier this Moon will be. This Moon sign needs to talk it out. There’s also a great requirement for “wiggle room” - as in being able to change its mind and to keep options open. When there’s a chance to express curiosity and exchange ideas, this is a happy moon indeed. Even more so when it’s done in a playful manner. A good (but probably slightly childish) joke will warm this Moon up, and it’s also a sign up for a bit of light-hearted banter (as soon as it feels safe). “Home is where the heart is” rings truer for this Moon sign placement than any other. There can be a tendency to be patriotic and clannish, and it’s also seen as a very maternal and (self)protective placement. This Moon sign is also a natural (but not necessarily skilled) empath, which generally involves a significant amount of emotional vulnerability… hence there’s a need for protective armour. This Moon is happiest when they feel safe enough to drop their guard, but it can take a while to get there. You’ll know this Moon sign is content because you’ll feel an authentic emotional warmth. Their self-expression will be radiantly playful, friendly and child-like. This Moon sign needs to be kept entertained and feeling like the star of the show and also craves approval. And if they’re generous and supportive towards others, then this is usually all easy to get. The flipside is childishness as opposed to child-like; or self-centered in the negative sense. This one can throw a masterful tantrum, but ultimately is just a pussycat. This Moon is a creature of wholesomeness and habit. Purification rituals of all types help to soothe any ruffled feathers, grounding them in the present moment and assisting in the re-establishment of order and control. Rituals such as tidying, grooming, sorting or anything else that refines. There can be a tendency to be critical of their own (or other people’s) emotional chaos. It’s unsettling, and the preference is for a demure and orderly approach to home and life. Unfortunately feelings don’t always conform to expectations or fit in tidy boxes. This is the other Moon sign that, like Taurus, is likely to express itself with artistry. There’s a grace, tactfulness and instinctual harmony implied by the Moon in Libra, as well as a deep need to relate well to others. Most especially to their significant others. You’ll know this Moon’s in a happy place because other people around them will be happy, and their home will have a certain aesthetic refinement. They might not have time for ugly or unbalanced emotional expression, preferring to people please rather than thrash it out. Emotional diplomacy may be their greatest talent. The Moon in Scorpio represents an intense, as well as profound, emotional style. There can be obsessiveness, turbulence, and other dark undercurrents. Still waters truly run deep with these souls, as do their passions and their insecurities. The occult, secretive and hidden dimensions of life (and death) are where they feel at home. Supernatural, witchy, depth psychology. However they may appear be a closed book, their moods a mystery even to themselves. Peculiarly, it’s when emotions are at their most intense, that this Moon sign is likely at its most empowered. The philosophical Moon. This sign is hungry for new experience and all types of adventure. It’s an emotional style that is nourished by novelty. And there’s likely emotional extroversion to some extent. Sagittarians can be loud. And you’ll know they’re happy because there will likely also be a lot of laughter. This Moon can vacillate between cynicism and optimism, and that tension is part of what makes life so humourous for them. The challenge is to remain much more on the curious end of the spectrum… and not fall into the trap of believing they know it all. This Moon style is happiest when it has a mountain to climb. Work is a comfort. This might be about worldly success, but it could also look like the work of negotiating inner emotional terrain. The Capricorn Moon sign instinctively knows that the management of inner emotional landscape is critical in order to accomplish their meaningful outer world goals. This is not a light-hearted or fluid placement, but being sober, or introverted, is not necessarily negative. The Aquarius Moon style is more comfortable at a distance, but still craves involvement. They’re emotionally invested in our collective welfare, but might come across as being totally detached in everyday interactions. This sign has a lot to learn before they can naturally exude a warm, empathic response. But once they have that, they can be a force for emotional healing as this blends with a natural coolness and compassion for various human quirks - serving themselves and others well in everyday crisis. The Moon in Pisces is a true dreamer and extra-sensitive to all sorts of goings-on in their environment. This lack of boundary between self and everything else can be tricky to master - or even just basically negotiate in daily life - but artistic or spiritual pursuits provide suitable pathways to nourishment and security for these sensitive souls. There's a fine line between a transcendent experience of life and an escapist one... this Moon needs to learn the difference or potentially lose themselves down the wrong rabbit-hole. I would love to see your results if you play around with this! Tag me on instagram @schoolofdivination. The priestess (The Moon) and The Star (Aquarius).